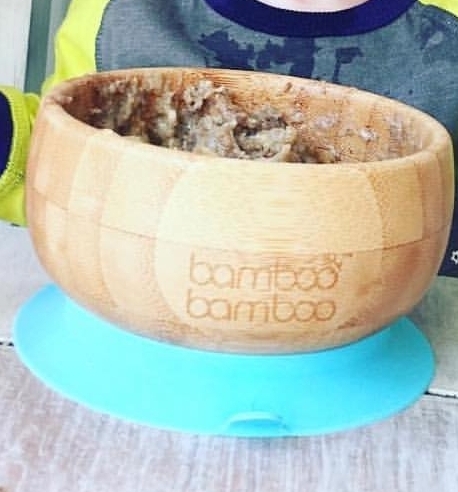 I absolutely love using our Bamboo bowl - we use it throughout the day, it's perfect for cereal, pasta, rice, porridge etc. The bowl is so deep so you can certainly cram a lot into it which is great as their appetites grow. The spoon has a large base so can contain a lot of food & also has deeper ridges to help contain it. The suction pad is strong but I do feel after a while it becomes less effective. You must remember to oil this product as it may crack! We received this as a gift and it was perfect. Lovely looking and does the job perfectly, the spoon is really soft for baby to use himself. I absolutely love these bamboo bamboo dinner sets. The quality is great so they're long lasting and therefore worth the higher price tag in my opinion. They look very nice and of course they're much better for the environment than plastic alternatives. I find that the suction works really well too and my LO hasn't been able to pull it off his tray (ikea high chair tray). I like that there are lots of different designs and colours to suit everyone. My LO also really likes these spoons. They're the best ones we've tried and he can feed himself well with these spoons. The only downside is that they don't go in the dishwasher. This isn't a massive issue but is a little frustrating when you're trying to tidy up quickly and/or have lots of dishes/meal prep to tidy. Overall, a great product and I have already recommended it to my friends. Absolutely love bamboo items & my girl loves them to! Very stylish and different. Better then plastic cheap ones. Only down is you can put them in the dishwasher and it’s not microwave safe so a little difficult with blw. This bowl has been amazing for weaning my little one. It is easy to use and clean, with an amazing suction design to stop babies and toddlers tipping, picking up or throwing the bowl. However, in my experience the spoon was a little bit to big for my daughters mouth initially, but I do like the softness rather than hard plastic like others I’ve used. Overall, great for weaning babies and I shall continue to use for feeding as she grows. My baby boy found it very easy to feed himself the chunkier meals using the bowl. We havent used the spoon yet as he has been feeding himself. It does stay suctioned to the tray for a bit but not for the whole time. Its a pretty design which I love and the feel of bowl is wonderful. Everyone who sees it compliments it. Purchased this Bamboo bowl and also a plate because I loved the unusual look of them. It sticks very well to the highchair and my child couldn't pull it off. It cleans very well and I put mine in the dishwasher. Very nice product a little expensive but I feel worth the extra. Would recommend. Easy to clean, easy for the baby to use. This bowl and spoon are great for when the baby is eating solids. They are a good shape for the baby to use and very durable. The bowl and spoon set is an amazing product for beginners. The spoon is soft and it is shaped to help the child hold it without my drops. I have used it with almost every feeding and we love it! Can’t wait to try other items from bamboo bowls!!! Loved as a first time mum that it sticks to the high chair and they are very easy to clean. I felt confident that the bowl was clean and all germs could and were cleaned away. Makes meal time cleaner. Once your toddler figures out how to unstick them ? These bowls are of the best of quality, reasonably priced. Easy to clean and use, although my little lady has found out how to unstick them. I love the fact these aren't plastic as well so much longer lasting. Natural, suction pad, environmentally kind. We love these bowls i have actually bought the plate and spoon set as well. I did buy a cheap bowl and plates but seen these and had to get. The bowl is great when starting baby led weaning and the spoon is great it has a rubber tip which my boy loves to chew on ( hes teething bad) so soft on his sore gums and it has a chunky handle which is great as my boy is able to hold it with easy. I love the bowl has a suction pad, no more having to picked his lunch/tea up from the floor. (Oh he trys to pull it but no luck mummys winning this one) I was a little worried about washing it being wooden but I shouldn't had the suction pad is removable which helps when cleaning it's just so easy to clean and look after. these bowls are very high quality and look beautiful and come in a few lovely colours. They may seen highly priced but are well worth the money in my eyes and what i find great is that they are environmentally kind! This bowl looks great and has a choice of colours, the spoon that comes with it is the easiest for my 5 month to hold and the wide flexible end ensures he doesn’t jab himself too hard and reaches his mouth more successfully . A must have for a BLW when using softer foods the suction base ensures he bowl doesn’t go flying when baby pulls it to investigate . This bowl has been great for my baby and toddler. It keeps it suction on the high chair and the design of it means it’s easy for her to use her spoon to scoop up her dinner. Bought this bowl when my baby started weaning! It’s a lovely bowl that sticks well to our high chair!! My baby has started to feed himself from it and can hold spoon well! Would def recommend! Only downside is it’s quite expensive but I got it on offer! We went through so many bowls before we found this and it was brilliant. The suction is great and it's really good quality so the bowl has lasted for ages. My daughter is three next week and it still looks brand new. When weaning she would throw everything so this was perfect as she couldn't take it off or knock it over. Great product. This bowl is great for anyone starting baby led weaning as the suction means it cannot be thrown onto the floor (as much as my little boy tries to pull it off!) The design is really modern and looks much sleeker than most other baby bowls. 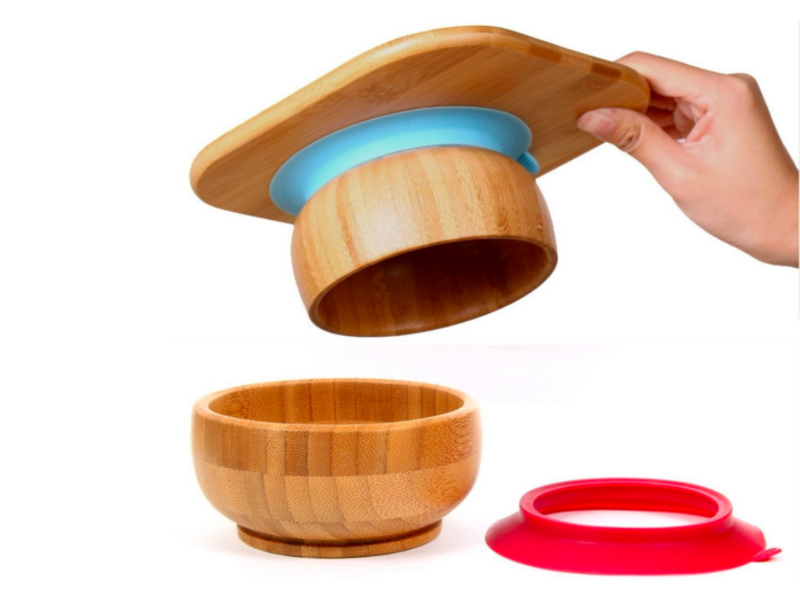 It is easy to clean as the suction ring can be removed from the bowl and it’s made from bamboo which washes really well. It may seem expensive but I only have one so it gets a lot of use and is well worth it. I need to buy more! 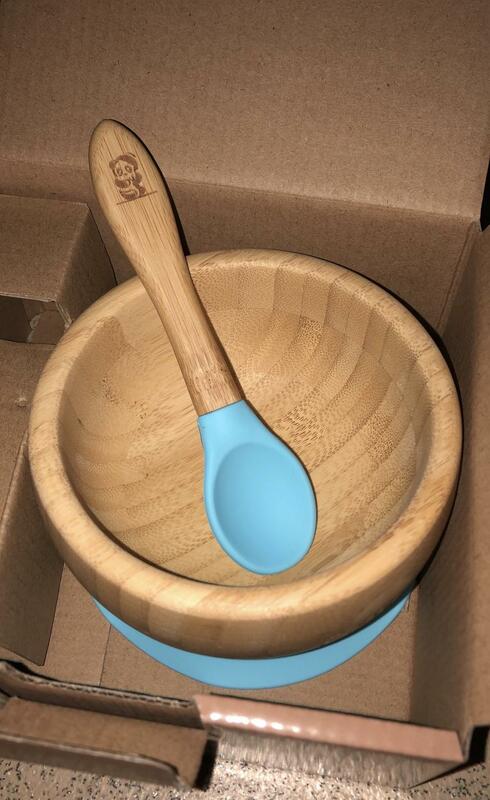 Bamboo bamboo bowl and spoon sets are just amazing. The quality of them is superior. They are environmentally kind. Easy to wash/look after and just look beautiful. The spoons are great for weaning (rubber tip for sore gums and shallow spoon) and self feeding (nice chunky handle). I’m not sure how the bowl will be used once baby is older as it’s not huge but that isn’t a worry yet....fingers crossed they bring out an adult equivalent. 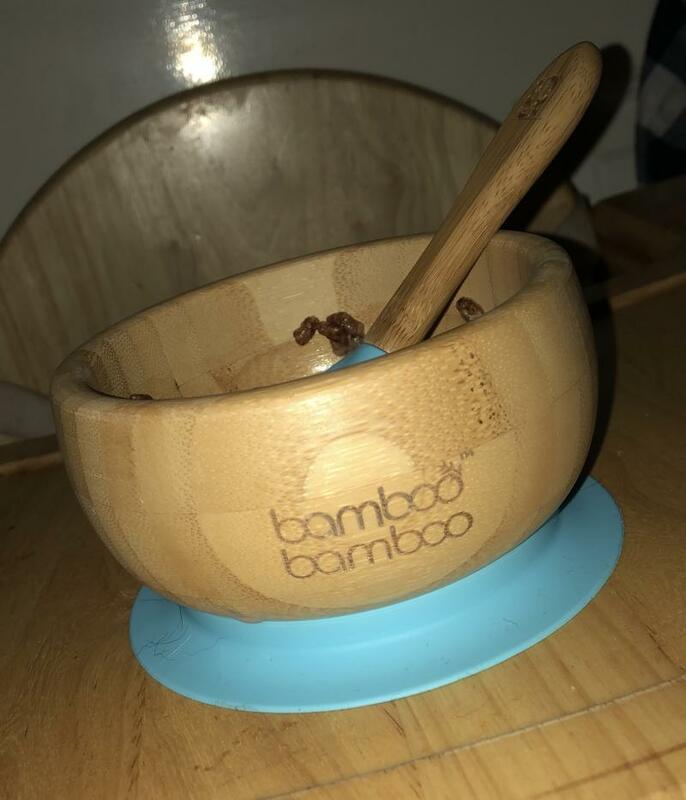 We have been using the Bamboo Bamboo suction bowl for 8 months since beginning BLW with my son. We tried 3 different bowls with my son and this one is the only bowl that he wasn't able to pull off of the high chair tray. The bowl is very easy to clean and does not stain. The spoons are great for preloaded spoons and self feeding. This bowl is a must have for Baby weaning, especially baby led weaning as the bowl is wide and easy to scoop food out of but it also sticks well to the highchair tray so baby can't chuck it on to the floor. The bowl looks lovely too and is very easy to clean, no food staining! An award winning weaning product, kids will love learning to feed themselves with Bamboo Bamboo's Baby Suction Bowl and Matching Spoon Set, Suction Stay Put Feeding Bowl in natural bamboo. 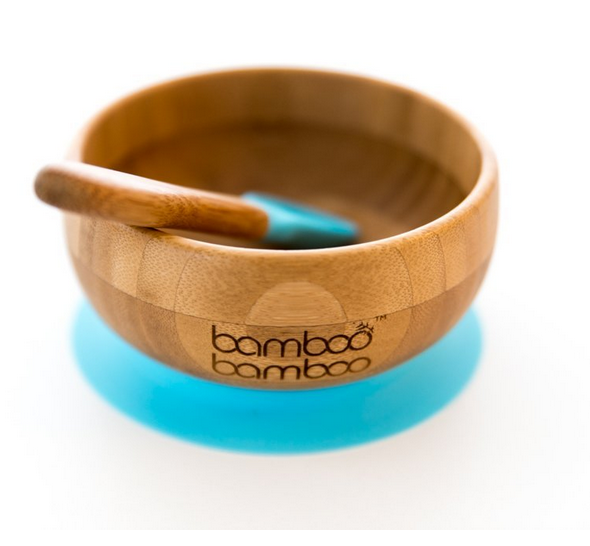 The Baby Bamboo Bowl with Silicone-Tipped Spoon and Suction Base provides natural BPA-free feeding. The feeding set is lightweight, stain-resistant and naturally no harsh chemicals or dyes are used to produce them. 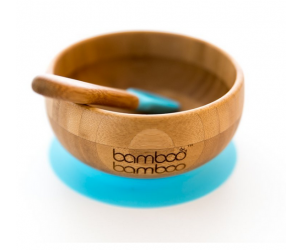 The Baby Bamboo Bowl features a strong suction bottom that securely keeps the bowl in place. The suction prevents splils and slips and means more food in your baby than around your baby! The bamboo spoon is tipped in matching silicone to be soft on baby's gums and protect new teeth. Easy to lift after meals, just pull the release tab and wash everything by hand to protect the bamboo. Choose from six fun colours: blue; yellow; cherry; pink; orange; or green. Please note that bamboo is not suitable for microwave oven or dishwasher. When your child is ready for regular plates and bowls, remove and keep the silicone suction base to use them yourself for soups, salads and more.